Traveling during the holidays can be stressful and we often arrive with arms full of packages and not quite enough patience. After a whole lot of hassle dealing with weather, crowds and not quite enough time, however, being with friends and family is well worth the trouble. Whether you’re arriving for a party or staying the week during the holidays, it’s always nice to bring a little gift for your hosts. While the holiday season is full of thoughtful little baubles and stocking stuffers, a plant is the perfect present to bring pleasure the whole year through. The glossy leaves and gorgeous flowers of the gardenia plant will be beautiful on the table or windowsill long after other presents have been regifted. The evergreen leaves of the gardenia plant are similar in size and shape, and just as shiny, as the holly- but are soft instead of prickly. The new, more compact varieties being sold this time of year look amazing on the table as part of a centerpiece, but rather than berries, the plant wields the purest white of blossoms. The fragrance is unmistakable and practically indescribably; sort of floral, a little spicy, sweet- without being cloying. In the Victorian language of flowers, the gardenia is said to represent purity and secret longing- words which perhaps come the closest to describing the alluring scent of this flower. A relative of the coffee plant, the gardenia is native to tropical climates, but loves short days with less light than darkness, so even though they prefer warm temperatures, they won’t flower until the days are at their shortest in the dark months of winter. For this reason, they are often available and at their finest this time of year. There are over 200 different species of gardenias and in warm, southern climates, they are grown outside as shrubs. New cultivars, and more compact species, such as Gardenia jasminoides, make great houseplants and are able to grow year round in a bright, sunny window. Lovers of high humidity, it is helpful to add a little moisture by spritzing them from time to time with a squirt bottle, especially in the winter months when air is a little drier. Another strategy that requires little hassle is to put a bit of pea gravel or small pebbles in the bottom of the saucer and add a bit of water to it each time you water to increase humidity around the plant without having it sit in water. 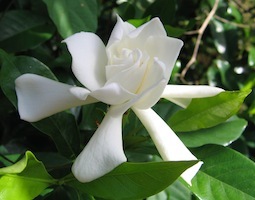 Even if your hosts aren’t green thumbs, the gift of a gardenia, with its intoxicating smell, is the perfect hostess plant. Consider serving this southern beauty with a bit of Southern Comfort mixed with eggnog.